Boxes can have lots of different purposes. Some are used to store things while they are transported. 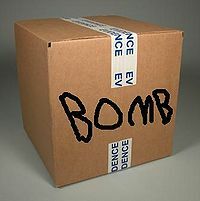 This box was storing a bomb on the A3480 flight from Dublin to London. 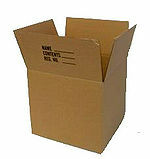 Boxes (Latin: Boxamus) are cubic or cuboid hollow structures used to hold or store matter inside them. Many boxes come with a lid in case you turn the box upside down or visit Australia and the matter falls out the top of the box. Each side of the box has to be strong enough to withstand the pressure of the matter inside it otherwise the box will fall apart. When a box has fallen apart in scientific terms it is no longer called a box, however theistically speaking the soul of the box is still intact. For carrying substances of different states of matter boxes are made from different materials. For example, if there was a liquid in the box the sides of the box would be made from impermeable material such as a polymer. Depending on what size or volume of matter is in the box the box will have greater or lesser volume. This has disadvantages as bigger boxes are hard to transport and smaller boxes fit less volume. Packaging boxes are traditional boxes used to store cards in a pack (otherwise known as a pack of cards). These are the smallest form of box and so are widely used by removal men to deliberately damage all a person's belongings by squeezing them into the packaging boxes and charging the person extra for all the boxes. The back of a removal van. "That'll be £350 worth of boxes, dear." The term "Jack in the Box" derives from the fact that packaging boxes were used to store packs of cards including the Jacks. When players were playing "Chase the Jack" in the mid 1800s (now called "Chase the Ace") they removed one Jack and placed it in the box so it became known as "Jack in the Box." Then one night a man named Thomas Lee left the Jack in the Box overnight and he had a nightmare that it would jump out and scare him. This story was incorporated into modern culture as now a "Jack in the Box" is a clown named "Jack" who jumps out of a box. A ballot box is the least used form of box. Many countries do not have ballot boxes and some that do hide them in a corner and only bring them out when the UN inspector arrives. The ballot box is shaped like a bin and acts as a bin for most of the time until an election comes about when a sign is stuck on it, reading, "Ballot Box helpfully donated by the Conservative Party." Matchboxes are the largest from of boxes. They are called match boxes as they are as big as a football match (or pitch). They are used to carry huge pieces of infrastructure or technological machines down motorways to their destination. Matchboxes have stored and transported the Space Shuttles, the Saturn V rockets, the Great Angel of the North, the Hoover Dam, the USS Enterprise and the Death Star. A cheery policeman standing outside his police box. Matchboxes are known to be fire risks as they have friction pads that run along the side of the boxes that can cause anything it rubs against at high velocity to catch light. The friction pads were originally intended to warn the driver of the transporting vehicle whether the side of the box is touching the side of the road or not but many disused matchboxes are now used for lighting matches, which were invented after the matchbox for starting fires. Police boxes are found commonly in locations all around Britain called "scrap yards." They used to be used in the police service so that if there was an emergency the telephone inside the box could be used to call an answer machine so that the operator could deal with the emergency five hours later. All have been withdrawn from service. Like all boxes the police box was originally designed for transportation. The police box can transport people all around the Universe in time and space. During the early half of the eighth century, it is said that King Arthur's private wizard, Merlin, crammed all the bad emotions into a box so that the World could be reborn and that Humanity would find themselves in the Garden of Eden again however while God was chairing a discussion with angels and religious leaders of the world, using telepathy, to review Humanity's position in his favourite species list, a girl named Pandora found this box and opened it to discover what was inside. Upon doing this she released all the evil things back into the World until only one emotion remained at the bottom of the box: "Regret." Regret that she had opened the box in the first place. This sole factor caused the oppression of womankind in the World for more than one thousand years. The Mathaius Theorem of a box denotes that if you take a box and you rotate it forwards, backwards or sideways then that box will be in appearance exactly the same as in its original form. This theorem was used in the University of Cambridge in 2004 to prove that if someone takes a box, draws a pen mark on the front of the box and then turns it away from them, they can no longer see the pen mark on the box. Science of the Box, also known as Boxology. Many skeptics however did not believe that if a cube box was rotated forwards, backwards or sideways it would look exactly the same and thought that mathematicians were deceiving the public as there was no proof that they had actually rotated the box as the rotated side looked exactly the same and the pen mark could be easily erased. The so called, "Theory that is proven by the opposite of what the theory states" Theory was proven wrong by a mathematical genius, Dr. Kaslklinkov who proved the Mathaius theory correct (in the case of a cube) to the skeptics by painting each side of the box in a different colour so that when it was rotated it would change colour. However in 2008, just four years after the success of the theorem and four years of testing the theorem a fault was discovered in the theorem. The theorem did not stand true for cuboid boxes as when they were rotated the new side would be longer or shorter than the other. Discovering the flaw in the theorem was a major achievement for mathematicians as they learnt to use their eyes and actually observe the change in the length of the box after a rotation instead of trying to mathematically solve the problem. This is an example of a box the right way up. This can be proved as the lid is on the top. Boxers are people employed by removal firms to box up items for transportation. 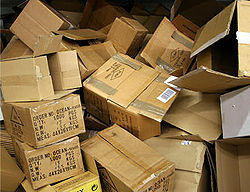 They are specially trained in using cardboard boxes to store items of property they find in a house. The Guild of Boxers is an ancient guild running back through centuries in which local boxers would join together to form a boxer society, otherwise known as a "boxing ring." "Boxing Day" was the nickname given by boxers to the day of the removal when all the items must be boxed up and placed in the removal van. The most famous Boxing Day was on 26th December 0AD when the Christ family were moving from Bethlehem to Nazarith. The son of the family, Jesus Christ, later went on to have a respectful, well-known career and so the Christ family Boxing Day is now celebrated as the generic Boxing Day every year in memory of Jesus Christ. Another less well-known fact was that Jesus Christ and Sarah Superstar's son Jesus Christ-Superstar went on to invent the "crate" which was a spin-off of the box but had air-holes in it to allow for ventilation through the box.